The idea behind Jetpack Fighter, the first mobile game from the makers of Smite, might be a hard to grasp. See, you’re this fighter, and you’ve got a jetpack. Still following? 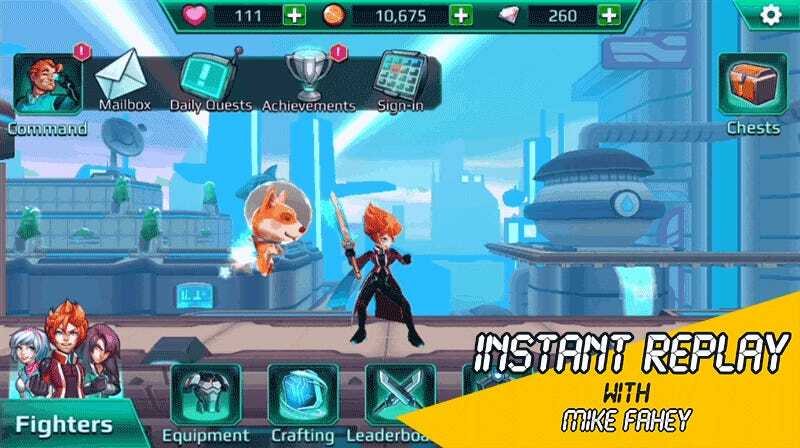 Launched last week on iOS and coming as soon as humanly possible to Android, Jetpack Fighter is a game in which a variety of anime-style characters (and sometimes a space dog named Bento) fight using jetpacks. It’s a simple matter of swiping your finger where you want to go or over what you’d like to attack and presto—everybody was jetpack fighting. On the surface its all quick and dirty swiping fun. Missions rarely last more than a minute, controls are responsive. Dig a little deeper and there’s a crafting system to screw about with, multiple character tiers to upgrade to and a handful of new fighters to unlock, including Smite god Nemesis. Players who link Jetpack Fighter to their Hi-Rez games account even get a fresh skin for Nemesis in the third-person MOBA. There’s been a bit of nasty lag since the game launched on Thursday, but Hi-Rez has been slowly adding more servers to the point where I’ve not seen a “Contacting Servers” message all morning. Jetpack Fighter is a cute little game thus far, and the urge to participate in its brand of microtransactions hasn’t felt pressing, though I did buy a $2.99 pack that came with a space dog. Time will tell if the slow trickle of discs needed to unlock new characters frustrates me enough to spend $14.99 to unlock them all or if the game’s energy (hearts) system gets the better of me, but for the time being I am content to swipe all of the robots until they are dead.